Early in 1967, Col. Robin Olds, Commander of the 8th Tactical Fighter Wing hosted a tactics conference at Ubon Royal Thai Air Force Base. On May 23, the senior staff at Korat hosted another more comprehensive tactics conference for fighter pilots flying combat missions in Southeast Asia. The group was dubbed Red River Valley Pilots Association after a heavily defended combat area in North Vietnam. The project officers at Korat began the gathering in style by providing elephants for VIPs to ride from the flight line to the officer’s club. The afternoon was taken up by the serious business of discussing tactics for large formation “Alpha” strikes of multiple waves of aircraft from different wings and bases. After the tactics portion was finished, the pilots enjoyed a relaxing evening beginning with a speech by Col. Daniel “Chappie” James Jr., the 388th Tactical Fighter Wing Vice Commander. The remainder of the night was taken up by fighter pilots “hangar” flying, renewing friendships and generally having a good time. Around midnight, Col. Olds introduced what would become a classic RRVPA activity — the MiG Sweep. Basically, several (six or so) pilots would link arms at one end of the club and “sweep” the bar, knocking down everything and everyone they contacted. The MiG Sweep generally started a fight; however, it gave the pilots a relatively harmless outlet for combat stress and a way to build unit cohesion. The RRVPA gathering was dubbed a practice reunion in honor of all prisoners of war being held in North Vietnam. 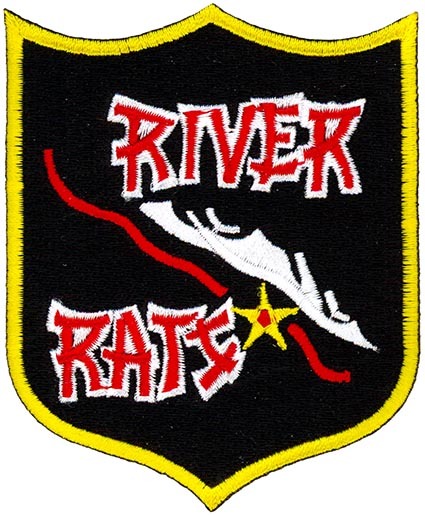 The group adopted the nickname of River Rats during its second practice reunion. A contest was held to select the group emblem and nickname and the pilots of the 469th Tactical Fighter Squadron submitted the winning entry. The first official RRVPA reunion was held in August 1973 after the release of the POWs the preceding spring. On April 30, 1975, the name was amended to Red River Valley Association. The Red River Valley Association continues to have reunions and award scholarships annually.